Imperial Ruby was developed by perfumers Michel Almairac and Sidonie Lancesseur; notes include watermelon, morello cherry, bergamot, rose, violet leaf, sandalwood, musk, amber and cedar. 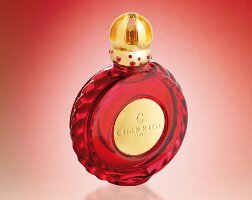 Charriol Imperial Ruby is available in 30 and 100 ml Eau de Parfum. So lavish, radian, seductive, ultra-sophisticated = fruit salad? I’m afraid the mere mention of watermelon as a note kills any interest I might otherwise have had in this perfume. I do love the bottle, which looks a lot like the bottle for Byzance (from back in the 80’s) although done in red rather than blue. Yeah, I also thought of the Byzance bottle. Watermelon pretty much kills my interest too. Just as well, have never seen this brand for sale in my daily life. I LOVE WATERMELON!!!!!!!!!! And this sounds EX-QUIS-ITE!!!!!!!!!! MY DEAR! and that bottle is So Comely! GIMME GIMME GIMME!!!!! First I admired that gorgeous red bottle design, then I read the first line: “fruity floral.” So in spite of the “woody” that precedes it, my building excitement immediately took a nosedive. I am not sure what a woody fruity floral is — would like to know Michael Edwards’ classification. If the main class is woody, that’s an entirely different kettle of fish. There are fruity florals I adore, mind you. But I don’t think any have watermelon. Just out of curiosity, what are some fruity florals that you like? Back when fruity florals were kind of a new thing, at least on my radar–and I’m talking about 15 or so years ago–there were one or two that I rather liked, though not well enough to spring for a bottle. Prescriptives Calyx. Parfums de Nicolai Eau Exotique (discontinued, I think). Hermes Osmanthe Yunnan & Un Jardin Sur Le Nil. L’Artisan Ananas Fizz, Eau de Givenchy. LoL – not your “typical” list of fruity florals! True — but what they mostly have in common is that they’re not so sweet as modern mainstream FFs…Calyx & Eau de Givenchy were made in the days before all fragrances were geared at tweens. Today, to get a FF that isn’t candied, you just about have to go to niche. That bottle reminds me of this really froofy glass bottle of bubbles my grandmother gifted me when I was a child. I remember she gave it to me because it looked like a perfume bottle. Avon had a bottle like that, right? Or some well known brand. Good grief, you’re right. It looks like one of the Avon ruby glass collectibles from the 70’s-80’s. Watermelon…and cedar? Putting me off my tea, that is. Ick. Pretty bottle though. The juice sounds interesting to me, but the bottle…. oy. How much cooler would it have been if they tried to make a faceted gem-like bottle, instead of a generic red circle? I ADORE WATERMELON! ADORE ADORE ADORE!!!!!!! Ummm…am I getting the idea that you like watermelon? Yessssss, every ultra-sophisticated woman I know loves to smell of watermelon and cherry. Blech! Charriol is available in Prague through Parfumerie Douglas, a German chain, so I had the opportunity to try their classic fragrance. Hope this will not offend anyone, but the most precise description is “menopausal fragrance for the rich”. Opulent, 80’s formula that smacks you in the face in an “old money” way. Opulent, but not sophisticated. Just picture the promenades at Cannes or Nice where ladies in their 70’s with heavy investment in multiple plastic surgeries take their pounds of gaudy jewellery out for a walk. If their perfumers try to rejuvenate the classic Charriol formula, it will look exactly like that – 70 year old lady trying to pass for 55 and failing. Hopefully they tried something new. Will report if I get a chance to sniff it.